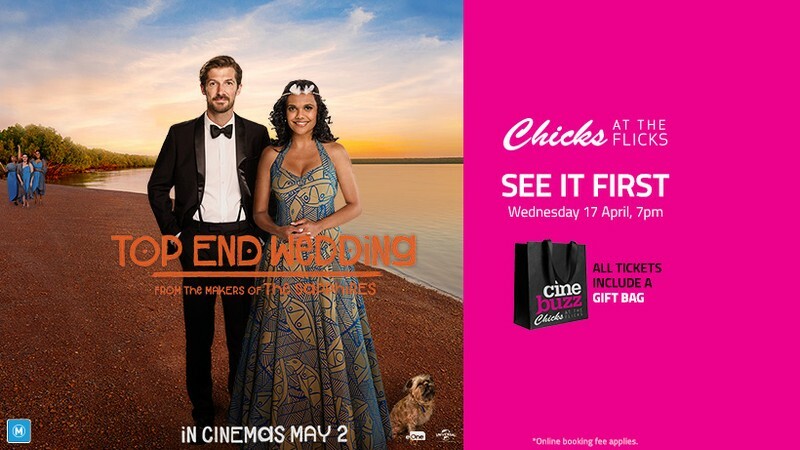 Gather the ladies and join us at our next Chicks at the Flicks advance screening of Top End Wedding. From the makers of The Sapphires, Top End Wedding is a celebration of love, family and belonging, set against the spectacular natural beauty of the Northern Territory. This heart-warming romantic comedy tells the story of successful Sydney lawyer Lauren (Tapsell) and her fiancé Ned (Lee). Engaged and in love, they have just ten days to pull off their dream Top End Wedding. First though, they need to track down Lauren's mother, who has gone AWOL somewhere in the Northern Territory. Enjoy a well-deserved night out with the gals and book your ticket today. Don’t forget—every ticket receives a bonus* gift bag on the night!